Entrepreneurs are notorious for biting off more than they can chew. In many ways this a fundamental part of entrepreneurship; it takes a ton of work, being a self-starter is crucial, and sometimes we over exert ourselves when trying to juggle so many things at once (not many of us can just drop everything else we’re doing to focus on running/starting a business). This is because most of us know that no one is going to care quite as much for our business as we do, and as such, we have to do more than others to keep it alive. As I take a step back to reflect, I realize I’m guilty – I’ve bitten off a little more than I can chew lately. Between working full-time, taking MBA classes in the evening, trying to start a business, traveling back and forth to Las Vegas to see my wife, and serving as a student council representative as well as several other boards and committees, I’m reaching my tipping point. Exhaustion is starting to kick in, and it’s becoming exceedingly difficult to do all of the tasks at hand (or at least do them well). Thankfully there’s a light at the end of the tunnel. With summer quickly approaching, I will have a significantly less schoolwork to do, which will give me some time to decompress and recharge my batteries. Still, when school starts back up, I need to find a way to take on a workload that’s a little more manageable. After doing some research, here are some tips I’ve come up with that will hopefully help me to better manage my work load so it doesn’t feel like I’ve taken on more than I can handle. Maybe it will help you to. The first step before you lighten your workload should be to figure out what is most important to you. Is it family, running your business, philanthropic work? Lay out all the tasks you have in front of you and really go through it to figure out what’s important. Maybe the board you’ve sat on for five years isn’t as exciting to you as it once was. Maybe it’s time to step down as president of your local running club and let someone else give it a go. 2. Make a plan to start scaling back your workload. Once you’ve gone through and figured out what is most important to you, make a plan to start scaling back or even eliminating the things that are lower on the list. In the board example above, you could consider dropping your position and instead moving to committee, or resigning altogether. The important thing is to start making more time for yourself. 3. Set aside time for personal projects. For many entrepreneurs, starting a business is something they would consider a personal project and is what they’re passionate about. This may be true, but it’s also important to set aside time for other things as well such as hobbies. Do you enjoy reading? Snowboarding? Yoga? Photography? Whatever the case may be, we need to make time for these activities. While they may not always seem productive, they are incredibly important for our mental health and well-being. They allow us the opportunity to decompress, unwind, and get our creative juices flowing, which in turn makes us more productive in all of our other functions. If you don’t have a hobby, now might be the time to start looking for one. It will pay dividends in the long-run. This is one where my wife would say I really need to take my own advice. 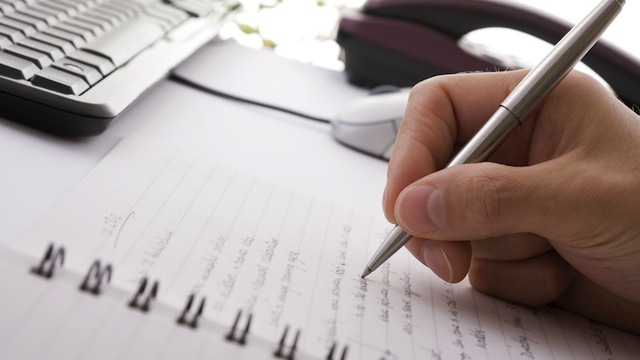 Writing things down can be an extremely useful tool for productivity. Whether you prefer lists, keeping a calendar, or setting reminders on your phone, often times it can help you accomplish tasks much quicker and more efficiently. Even when we have the same amount of work, it can make it seem a lot more manageable when we have it all in front of us. 5. Finish what you can. It’s important to understand the difference between a project and a process. One key difference is that projects have an end date, where as processes are on-going. People often get these confused and as a result, they can’t leave what they’re doing until they’ve “finished,” only to realize that it’s a process that will never end. If you’re trying to scale back on your workload, you need to know the difference so you can reasonably assess what you can finish and what you can’t. If you really are working on a project that has an end-date in the near future, try and finish it up or at least get it to a point where you can reasonably pass it off to someone. This is important as it reflects on our reputation and we don’t want to burn bridges by doing something half-assed. At the same time, if this a process (or even a long project), it’s likely going to continue whether we’re part of it or not. The goal again should be assisting the next person who will fill your role in the process, but only if it’s reasonable (not ten years out). And even more so, don’t be afraid to take help when it’s offered. This is something many entrepreneurs are really bad at, because they often feel the need to take everything on themselves. Much of this stems from personality traits that are inherent within entrepreneurs (err hmm… control freaks? ), but still it’s important to ask and to delegate tasks. At some point, we can’t do everything on our own, and asking for help will really take a load off. If this wasn’t a priority you listed in tip 1, you need to add it on there and it needs to be towards the top. Sleep is incredibly important for maintaining your health, as well as focus and mental clarity. You’re not going to do anything very well when you’re sleep deprived, so start figuring out how you can incorporate a full night’s rest into your routine. 8. When taking on new tasks, do it slowly and not all at once. While this isn’t necessarily a tip for reducing your workload, it can still help us take on tasks in a way that is manageable. One of my biggest problems is that I say “yes” to everything, and often times it’s all at once. If you’re going to commit yourself to a new endeavor, it’s important that you fully understand what it entails before you start taking on something else. Often times you’ll find the more deeply you get involved, the more the work piles on. By having a clear idea of what a new task will involve (which means actually doing it for awhile), you will be in a better position to assess whether you can realistically take on another. Warning: philosophical, fluffy stuff ahead. Continually re-evaluating our position is something that will help us to become more mindful overall. By taking a step back every now and then to reflect, we allow ourselves to assess how well we’re performing and adjust as necessary. Some people do this through meditation, exercise, or even just taking a vacation. The important thing is to look within yourself and figure out if what you’re doing is really making you happy and is something you find fulfilling, or at the the very least, is putting you on track to get there. Life isn’t about the destination – I think we’re pretty much all heading towards the same spot. It’s about the journey getting there, and I don’t think there’s anything more scary to me than the thought of taking that journey for granted. There will inevitably be ups and downs with turns at every direction. There will be times when we take on more than we think we can handle, only to find we’re far more capable than we gave ourselves credit for. Whether you’re an entrepreneur or anyone else, taking the time to figure out what’s best for you will be the greatest step you can take towards a better you. Bit off more than you can chew? Have tips that I missed for managing your workload? Please share in the comments below.